When your computer gets on your nerves, the Ctrl-Alt-Delete keys can come in handy; similarly, when life gets on your nerves and you get super stressed tea or coffee come in handy! So gets these Ctrl-Alt-Delete cups to show that you are taking a break and having tea/coffee! Everyone loves these cute little suicidal birds, thus they make a great gift for kids and adults alike. These fluffy little birds come with plush sounds. These are super cute and make super gifts! Know a friend who finds it hard to remember their USB passwords? They would love this old school security lock drive, as three digits are always easy to remember. Want an excuse instantly but can think of something original and good? Well, this is where this awesome Instant Excuse Ball will come to rescue. It provides you great excuses quickly to tell to your boss or your teacher. Just make sure your boss or teacher doesn’t already have one. Add some glam and life to your bathroom or kitchen sink with these LightInTheBox LED Kitchen Sink Faucet Sprayer Nozzle. These will change the color of the water that leaves the faucet, making it look really cool. Now you can stylize and glam up any shoes you want, thanks to these Light Up Flashing Shoelaces. These come in beautiful colors and make you literally stand out from the crowd! Know someone obsessed with UFO conspiracies and aliens? If so, then get him/her this amazing UFO themed 11-cube ice tray mold of flying saucers and cratered moons. Tiny Book Light is a perfect gift for an avid book reader friend who likes reading books in the traditional way. They will definitely find these portable book lights really useful and will thank you everytime they read a book using it in dark. 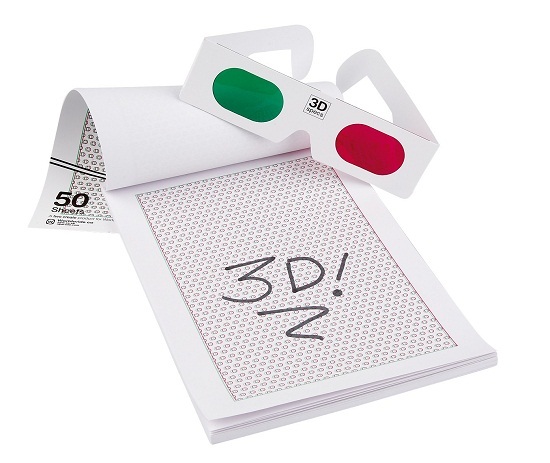 3-D Drawing Pad is, as the name suggests, a drawing pad that lets you draw in 3-D. It is an amazing gift for those who love sketching or doodling. If you know someone who is always online on Facebook and who can’t live without it, then these I Like Social Mugs would make a brilliant gift for them. Let them make a statement with these thumbs up ‘Like’ coffee or tea mugs. Some years back it was a trend to wear lockets with pictures of your loved ones inside. The Red Oval is a twist of those lockets – well, it is a digital photo viewer which can store up to 56 photos. You can also change the photos that pop up anytime. With this, you would be able to keep a photo of every single person you love. Thank you for posting all of these cool gift suggestions, Amina. I am looking for a few stocking stuffers to complement the big gifts I got for my wife this year. She knows that I work at DISH, and she keeps dropping hints that she would like a way to stream her favorite shows around the house, or away. What she doesn’t know is that I have picked up a DISH Sling Adapter, and when I connect it to our Hopper DVR, she will be able to stream anything she wants, wherever she wants. Now I need to get a few accessories for the iPhone I got for her to stream on. That Barnacle looks like it would be a great stand for her to watch TV on.